Way back when, the Sahara was not the arid pile of sand that is seen today. Instead, it was a bit on the damp side, with evidence of creatures that favored water, and even human inhabitants. Satellites show that under the sand, there used to be a huge network of rivers back then. Now, that's a puzzler. Secular scientists try to invoke the discredited Milankovitch astronomical theory to explain changes in Earth's climate, with unconvincing arguments. The better explanation is that during the Ice Age caused by the Genesis Flood, there were several conditions that brought greater rainfall. 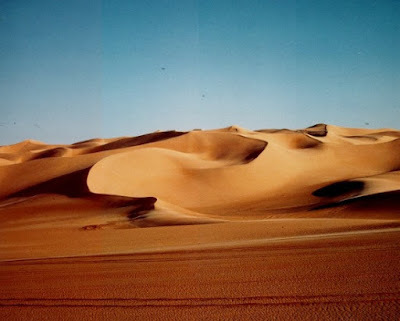 Scientists from the University of Arizona recently announced that what is now the Sahara desert was once wet and green and extended as far north as the Mediterranean Sea. The scientists examined chemical clues found within leaf waxes preserved in four marine sediment cores located off the northwestern African coast. Plants experience subtle changes in the chemical composition of their wax, depending upon the wetness or dryness of the climate. Because leaf wax washes into the oceans, it can be preserved in sediment cores extracted from the ocean floor. Hence, this team of researchers used wax chemical clues found within these cores to infer past climate conditions in the Sahara. To read the rest, click on "More Evidence of a Wet Sahara".